Fleas are very tiny dark reddish-brown creatures about 1/8th of an inch in size with six legs. They have a flat body from side to side, with piercing mouths that help them in sucking blood. Fleas are often confused with bed bugs, lice and ticks. However, fleas are reddish brown to black in appearance, and they are also wingless. They are found throughout the United States and are common in Eastern North Carolina. Fleas can live for about 100 days during which time the females produce 400-500 offspring. They feed on blood and transport themselves on rodents and other mammals, usually remaining on their hosts at all times. These pests use their powerful legs to jump as high as 8" vertically, which is 150 times their own height. If humans could do this, we would be able to leap over skyscrapers. Fleas infest both household pets and wild animals like opossums, raccoons and skunks. They can also be found on shoes, pant legs or blankets, which can transfer the fleas to new environments. Fleas are the most common transmitter of the rare bubonic plague. They also transmit the bacterial disease murine typhus to humans through infected rats. Their saliva can cause serious flea allergy dermatitis in pets and their debris has been reported to cause similar allergic reactions in humans. Fleas can also transfer tapeworms and cause anemia in pets, which is why active flea management is an important component of pet care. 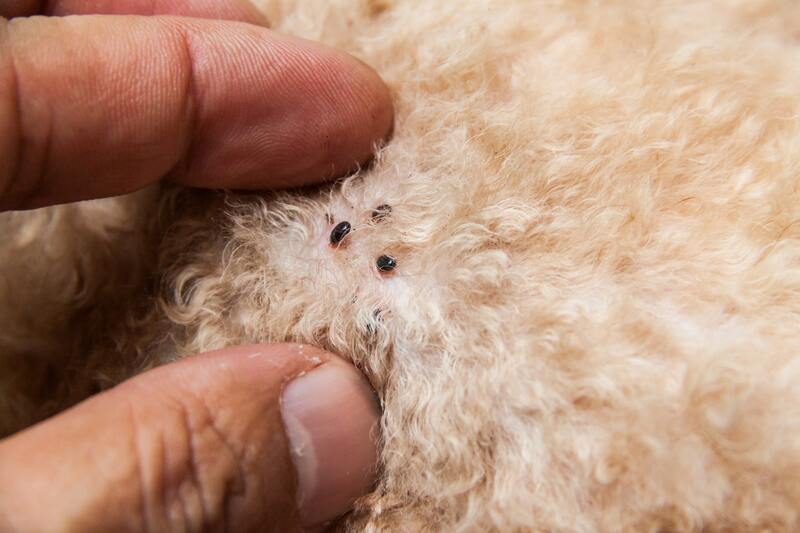 Flea bites commonly cause painful, itchy red bumps. Animals that live in your home, like dogs and cats, can easily bring fleas into your house. Fleas live on pets, in carpets, in sofas, and in or on other household and farm goods. In a typical room, 5 percent of the fleas will be found on pets, 10 percent flea cocoons in the carpets, 35 percent flea larvae and 50 percent flea eggs, again in the carpets. This can make it difficult for DIY flea removal. Don’t delay giving us a call as flea infestations only get worse with time. We can schedule one of our certified professionals to provide you with a free inspection estimate and educate you about flea treatment and flea control in Eastern North Carolina. Fleas - Did you know? A common misunderstanding about fleas is that they lay their eggs in your carpeting and furniture. Fleas actually lay their eggs on their animal host, meaning if your dog has adult fleas living in his fur, those adult fleas are doing their best to keep him infested with their offspring. Flea eggs, however, aren't particularly sticky or well suited for staying put, so they mostly roll off your pet and land in his dog bed or on the carpet. Fleas feed exclusively on blood, using their piercing, sucking mouthparts to siphon it from their hosts. An adult flea may take as many as 15 blood meals in a single day. And like any animal, a flea produces waste at the end of the digestion process. Flea feces are essentially dried blood residue. When they hatch, flea larvae feed on this dried blood waste, which is usually left in the host animal's bedding. Fleas don't thrive in low humidity, which is why they aren't as much of a pest problem in arid areas like the Southwest. Dry air prolongs the flea life cycle, and when the relative humidity falls below 60 or 70%, flea larvae may not survive. Conversely, the flea life cycle accelerates when the humidity is high, so keep that in mind when trying to control a flea infestation. Anything you can do to dry out the air in your home will help you win the battle against these bloodthirsty pests. Wheeler Exterminating Company provides pest control, termite services, and moisture control to residential, commercial and industrial clients in Kinston, Goldsboro, Greenville, New Bern and all of Eastern North Carolina. Copyright © 2019, Wheeler Exterminating Company, Inc. All Rights Reserved. Website by Edge360 Creative.